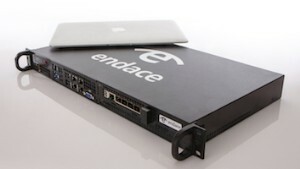 Launching at Black Hat this week, the EndaceProbe 114 is purpose-built for deployment in remote locations or branch offices. It offers the same 100% accurate recording, centralized management data mining and retrieval and application hosting as the rest of the EndaceProbe family but comes in a compact, short-depth format that makes it ideal for deployment in branch offices. The EndaceProbe 114 allows organizations to cost-effectively extend their network visibility right out to the network edge and eradicate the blind spots that can make branch office locations an attractive target for attackers. It seems everyone is in Las Vegas for Black Hat this week. We’re excited. Yes, we’re here too and we’d love to see you. So drop in and see us at Booth #1572 where you’ll be able to check out our new EndaceProbe 114 Branch Office Network Recorder, see demos of our Cisco® FireSIGHT™ Management Center and Splunk™ integrations and we’ll also be showing off the new features of EndaceVision 2.0. Plus we have some handsome battery packs and notebooks to give away. So swing by and say Hi. One of our customers said that once. And he was right. So with DAG 5.5.0 we’re introducing a revolutionary new capability. Now you can add “Provenance” smart-data fields to your capture files and streams to provide full, contextual information about where the packets were captured and what the environment was like at the time. Endace DAG cards have long been recognized as the industry gold standard for reliable and highly accurate packet capture and processing. But we wanted to ensure DAG quality is available to everyone, and we think the time is right for a shakeup in the capture card market. So we’ve set a new, aggressive low price for the DAG10X2-S to ensure it is the most affordable card in its class, bar none. Now there’s no reason to compromise on quality. If you are interested in purchasing the DAG10X2-S contact our sales team at sales@endace.com, or talk to your reseller, to find out about the new pricing. forensics or troubleshooting microburst performance issues. 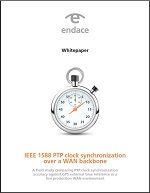 Endace CTO, Dr. Stephen Donnelly, has put together a whitepaper based on the presentation which he and Endace CEO, Stuart Wilson, presented at STAC conferences in London, Chicago and New York recently, which looks at the accuracy of PTP (IEEE 1588) timing in a live High Frequency Trading (HFT) WAN environment.